In the book, the author and his researchers have examined every detail of the driver’s life from his very earliest days to the last hours of his existence -and the people he left behind. It is a story many have tried to tell - but never in such a complete way. 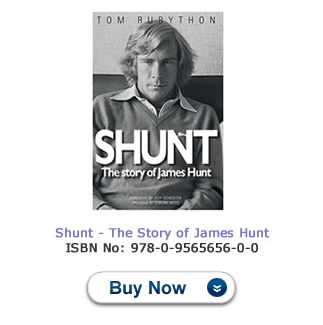 The book is about James Hunt’s life, his victories on the track, the girls he loved and lost and the huge amounts of money he earned and spent. No stone has been left unturned, no fact too small to include, including his lifelong devotion to dogs and budgerigars. It is the first proper story of a man loved by all those that knew him well but despised by people who did not understand the rules by which he lived his life. It is a story of a man whose like will almost certainly never be seen again. James Hunt is remembered more for his girlfriends and wild personal life than for his skills in a race car. But the excesses of his glamorous life in the seventies cannot hide the fact that he was, in many people’s opinion, the fastest driver on the Formula One circuits in the 1970s. In an era dominated by the likes of Emerson Fittipaldi, Niki Lauda and Ronnie Peterson, Hunt stood out in terms of raw speed and the ability to effortlessly plant a Formula One car on pole position. The first chapter will be very emotional and tell the story of his death. It started on the Sunday morning of 13th June 1993 when he cycled the six miles from his home in Wimbledon to the BBC Television Centre in London’s White City to commentate on the Canadian Grand Prix with Murray Walker. When the race finished he cycled home and began a marathon snooker match which lasted into the early hours of the following day. At around 2am on Tuesday morning, about to get into bed, he suffered a massive heart attack and collapsed beside his bed wearing his dressing gown. For nine hours he remained undiscovered on the floor with his two dogs, Jackson and Muffy, laid one each side, guarding their master. He was pronounced dead at 10am at the age of 46 his heart muscles had been fatally weakened by a life of hard drinking, recreational drug taking and smoking cigarettes. Niki Lauda will write the foreword for the book. Lauda was James Hunt’s closest friend on the racing circuits of the world. The two men famously battled for the 1976 world championship right down to the wire in Japan. In the end there was only a point in it. Lauda started his race career like Hunt’s in Mini racing, then saloon cars and single seaters. Sir Stirling Moss was a close personal friend of James Hunt and will write the preface at the front of the book. Although Moss was of a different era to Hunt he quickly became a close friend when Hunt entered Formula One in 1973. Although Moss had retired in 1963 he became Hunt’s unofficial adviser and the two spent hours discussing Formula One at various circuits of the world. Moss believed Hunt was his spiritual successor in Formula One and the two formed a close bond.